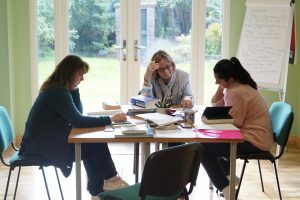 Autumn can be a perfect time to study here at Fleetham Lodge. We’ve had several students taking advantage of a quieter travel time, but still a reasonable time from a weather point of view – September and October can be warm and sunny. The colours can be truly magnificent once the trees begin to turn yet there are till some light evenings and warm days to enjoy. 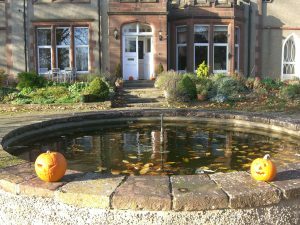 Many of the local attractions are open into early October and woodlands like Thorp Perrow Arboretum are open all year and beautiful in autumn. Some of the best courses to take now are the English with golf, cycling or walking as you can get out and about to enjoy the last of the good weather before we head towards the winter. 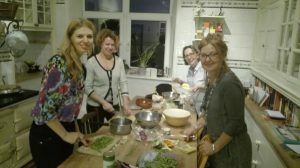 If you are considering a business course or our Quintessentially English course then these work too as whatever season it is there are always things to do and places to go. Our new biomass boiler will ensure the house is cosy and the open fires add a little romanticism to the darker evenings. 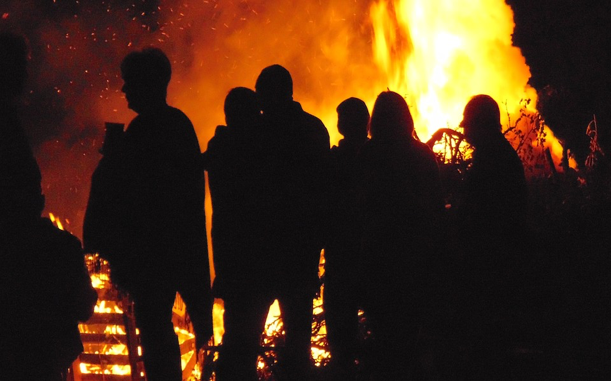 And, of course, we have two great celebrations in Autumn; Halloween and Bonfire Night. We love to decorate the house for Halloween with carved pumpkins, black and orange streamers and plastic spiders and snakes and for our junior students at this time we include lots of ‘spooky’ activities including our favourite, a torchlight treasure hunt! This is often the highlight for our juniors and we always end the evening with a roaring fire and a good, hot meal. Students can also create their own scary pumpkin faces and display these around the house. 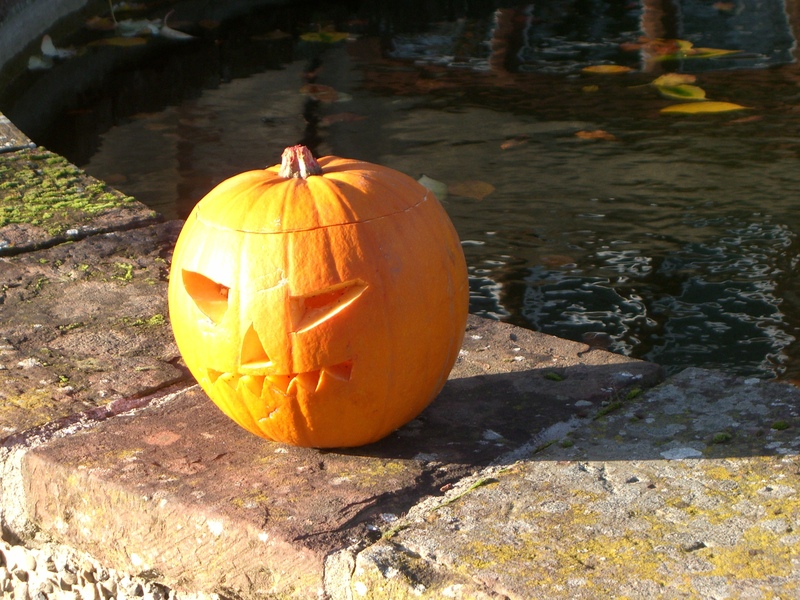 things and they can be very inventive) and play some of the traditional games like apple bobbing, as well as try traditional food such as parkin and toffee apples. Bonfire Night comes just a few days later and we have an organised event in the village that everyone enjoys. Hot soup, home-made burgers and hot-dogs, an outdoor bar with sparklers and dark toffee for the kids both large and small. 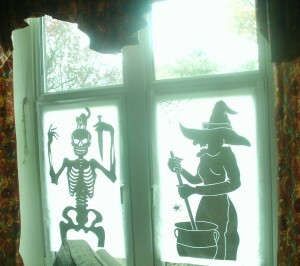 This age-old tradition still continues and brightens up a dark November evening. The firework display is usually spectacular and this particular festival takes everyone straight back to their own childhood. It’s a very special experience (despite its origins). Consider autumn at Fleetham Lodge – there is much to see and do! The summer is over and now it’s time to focus on the remaining months of 2017 and also to the year beyond. 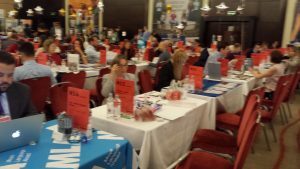 I’ve been silent – this is due in part to holidays but also mostly to attending the Alphe Workshop in London and to our two Fam Trips that we held here in Yorkshire for a selection of agents attending the workshop. 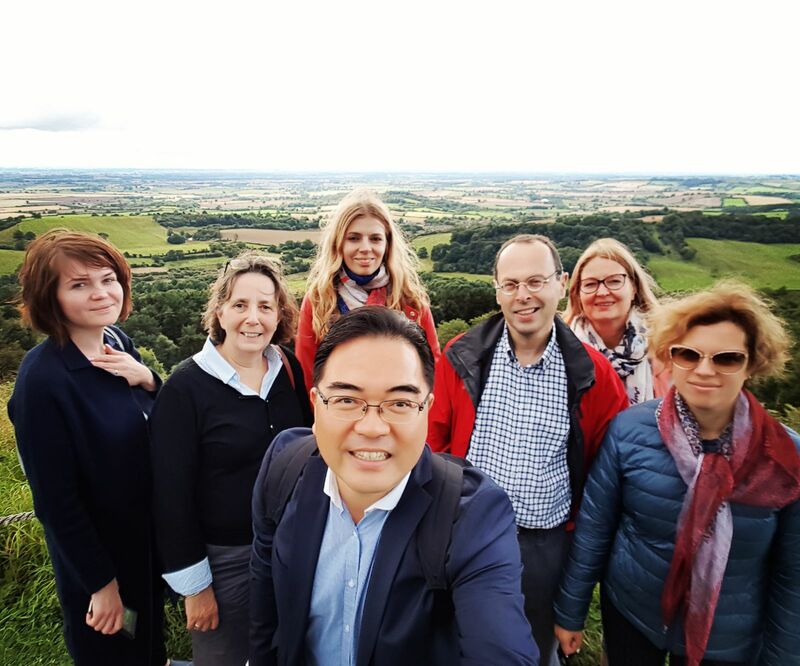 I thought I’d kick off my return to the blog with some insights into these FAM trips and also to share some truly wonderful photos (taken by our guests) that were taken to show the opportunity that awaits the students here at Fleetham Lodge. 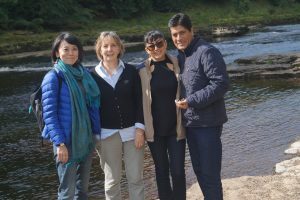 The aim of the Fleetham Lodge Fam trip is to replicate the experience that our student clients have when they are here with us on their courses – we literally wanted to give our agent visitors a snap-shot of how it would be for their clients. Each trip began with the journey by train from London to Yorkshire. 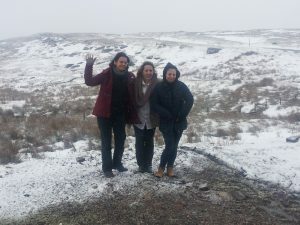 We decided to use the train to get people here as it is far quicker, just 2.5 hours, goes through some lovely scenery and also gives participants a chance to meet and get to know each other before they arrive. It is also the journey that some of our students take when coming here. We are lucky to be on the route from London to Edinburgh and so have plenty of direct trains from London Kings Cross to our local station – Northallerton. The journey from Northallerton gives the chance to see the area – which is very rural and agricultural but also quite lovely. The house stands quite proudly in its setting and this year the garden has been particularly lovely and colourful giving a very welcoming feeling. 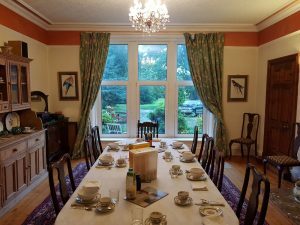 After a tour of the bedrooms and other facilities everyone took time to relax and unpack a little before we met together to go around the garden (we have 3 acres of garden to wander in including a well-stocked kitchen garden, tennis court and pond). Our bespoke classroom was the final destination where we all discussed the opportunity for various groups of students and had an in-depth question and answer session. By this time we were all ready to eat and my husband’s dinner of roast chicken, roast potatoes, green beans and carrots did not disappoint. 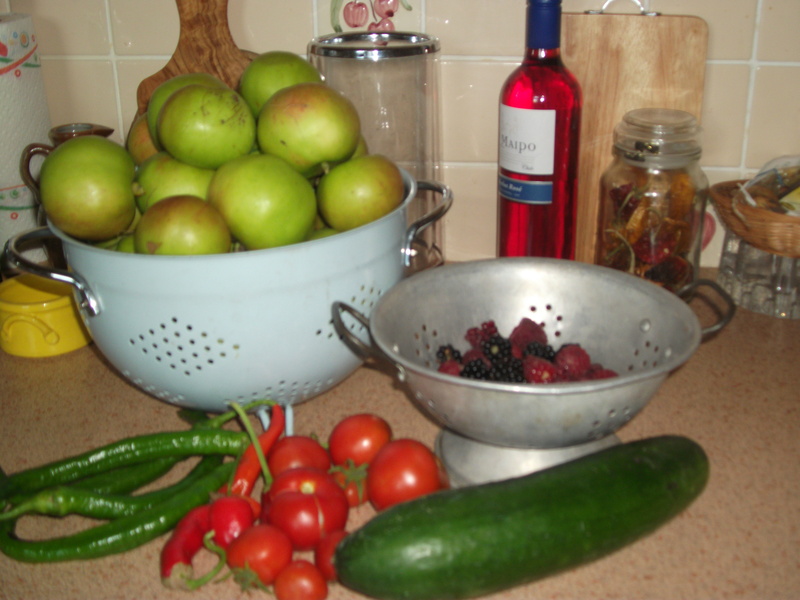 All the vegetables were from the garden (not the chicken I hastened to reassure as we do have 3 hens wandering around!) which gave them an extra edge of flavour. Washed down with a lovely red wine and accompanied by good conversation and the evening was both relaxing and enjoyable. Our loyal friend the dishwasher took care of the dishes and we all retired happily to bed ready for the start of the second day. The sun shone brightly during the first Fam trip and we headed off into the Yorkshire Dales to experience Aysgarth Falls which did not disappoint with its tumbling water and beautiful landscape. Lunch, sampling the local beer, was in a very traditional pub where we actually discussed what makes a ‘traditional pub’ with the pub landlady – lots of old polished wood, an open fire, traditional British food and drink and a friendly atmosphere – was the official line. Lunch over, we headed to Bolton Castle which was another great success even though it did rain a little. This is an old traditional castle (partially intact) which is very well- presented and gives a good account of its history and the society at the time of building through to its abandonment in the 1700s (life in a draughty castle had certainly lost its appeal for the wealthy families of the 18th century!). Afternoon tea is such an English tradition – although with our substantial pub lunch we were only able to share a piece of cake! 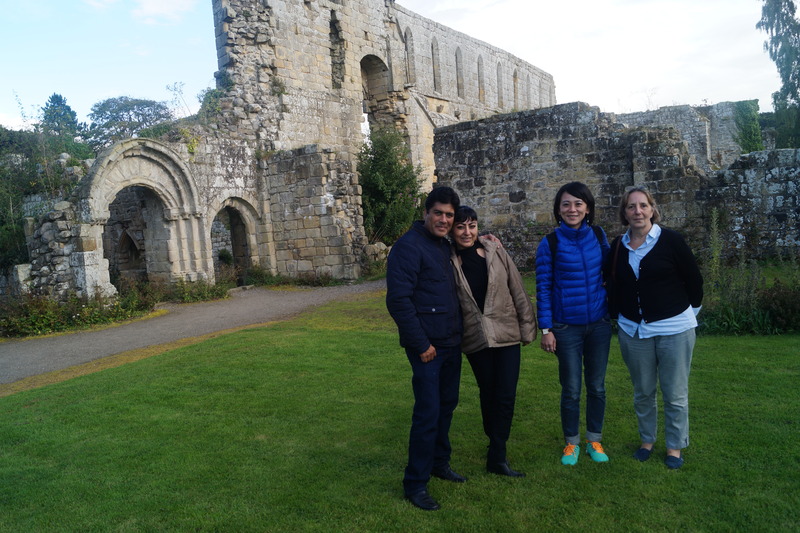 Nevertheless it was good to take the weight off our feet and enjoy a hot cup of tea before venturing forth to our final destination of the day – Jervaulx Abbey, a hauntingly serene and lovely ruined monastery just outside the town of Masham. 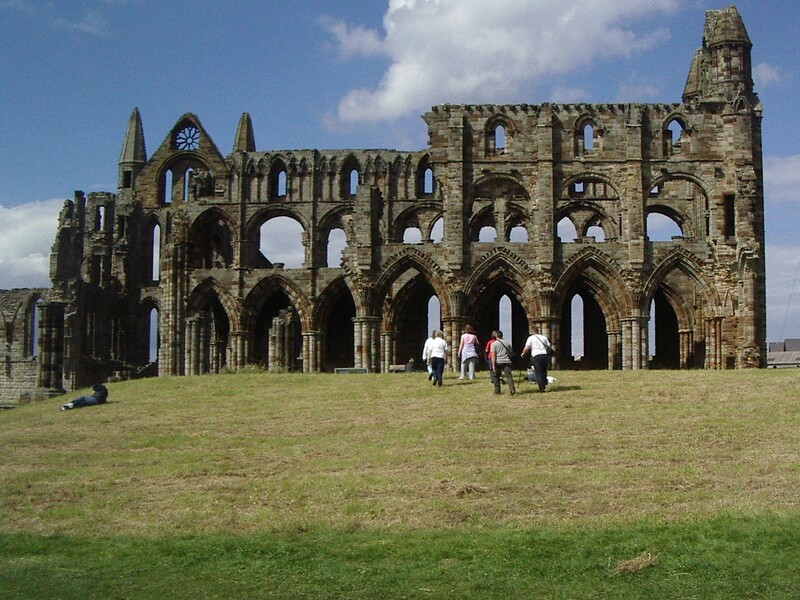 Although once a very impressive and important monastery, it was destroyed almost completely by Henry VIII. Yet as we strolled around the broken pillars and crumbling archways we could glimpse at its former magnificence. It had been a long day albeit an interesting one and we returned to Fleetham Lodge for a short rest before dinner. We passed an interesting evening joined by our 18 year old daughter Imogen and enjoyed some lively discussion! For the second Fam Trip we awoke to pouring rain! 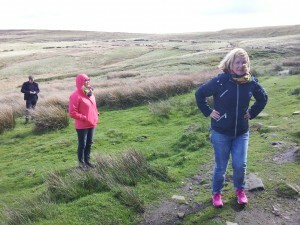 As the plan was to take a walk along the edge of the moors, this was clearly not a good start! However all was not lost and we decided to flip the day around and do the indoor part first. Things couldn’t have worked out better! We spent the morning at Nunnington Hall exploring first the house and later as the rain eased, the gardens. 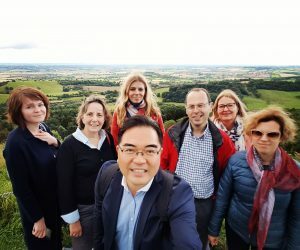 This took us to lunchtime which was enjoyed at Ampleforth Abbey – a living monastery and boarding school and after touring the grounds, abbey and visitor centre, we headed off to see the white, chalk horse at Kilburn. These chalk horses can be found all over England carved into the hills. Kilburn’s white horse is the largest, created in 1857. 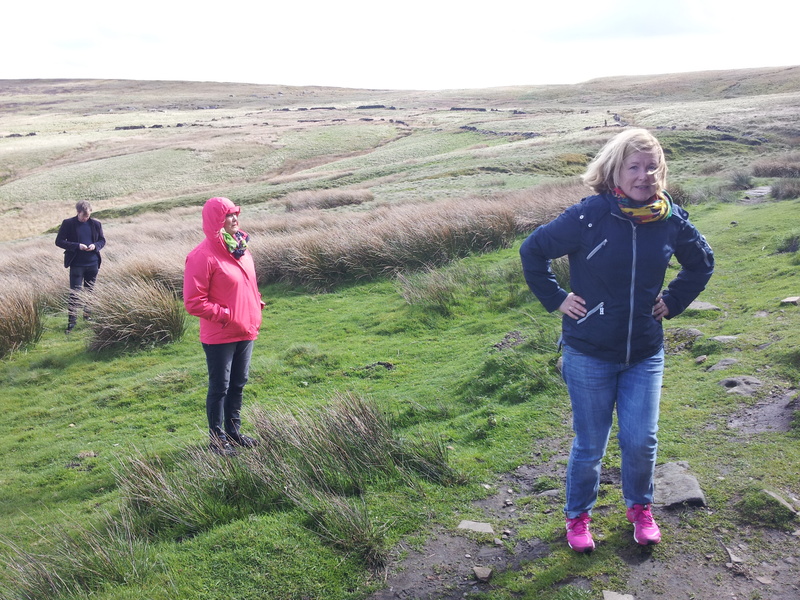 As luck would have it, the sun came out and we were able to walk up to the top of the horse and then follow the scenic path back to the Moors visitor centre. This walk in the sunlight overlooked the whole of the Yorkshire Moors and gave some truly spectacular views. Our group wanted to visit the supermarket to buy supplies for the home journey and we had also promised them a visit to the village pub. Unsurprisingly, it was quite late when we returned to Fleetham Lodge. 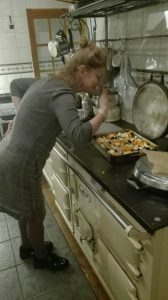 However, everyone rolled up their sleeves and mucked in to help with dinner and we had a fun time preparing the evening meal which we all thoroughly enjoyed before finally retiring to bed after a long but enjoyable day. Both groups awoke to a sunny day on Day 3 and were able to take final photos before we drove them to the train for the return journey to London. We’ve looked at various types of course, particular students and local places in the blogs over the past few weeks but a question you may be asking yourself is ‘When is the very best time to visit Fleetham Lodge for a course?’ The answer really depends on what you like to do and experience. 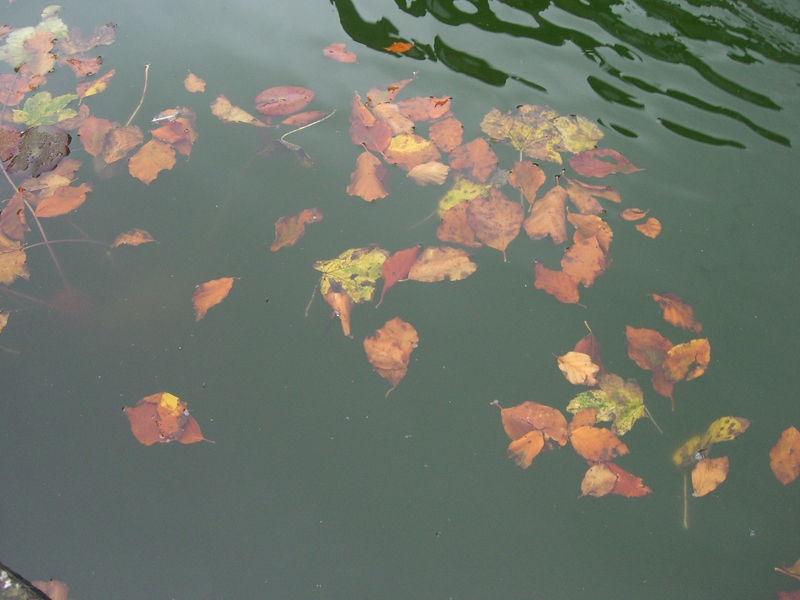 In fact there is no ‘best’ time as each season brings different scenery and different opportunities. For the next four weeks I want to show you the changing seasons here and also give you an idea about what things happen at various times of the year to help you choose the best time for you. We’ll start with summer. Summer is a wonderful time to come if you enjoy flowers and gardens. Our garden here is at its best from May to July and, of course, the weather is warmer (although temperatures are not generally higher than 25C). It is also the time when most of the stately homes, beautiful gardens and attractions are open (generally from April to late September). Summer allows us to sit around the garden in the evenings, eat outside if the weather is warm and even have our lessons outdoors on really balmy days. From a practical point of view it means you have less to pack as no heavy jumpers will be necessary (although for most people the UK in summer is much colder than your own summer). Our visits will mostly take in places that are open in summer some of the best being Newby Hall and Castle Howard both of which have lots of summer activities for young and old alike. 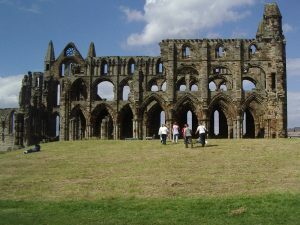 It’s also a good time to stroll in the gardens of these houses and take a picnic out to the Yorkshire Dales or Moors. Eating outdoors is a treat and one which is not so common here in the UK so when there is a chance we embrace it! Of course outdoor events are everywhere in the summer and these include plays (we’ve taken our students to 2 outdoor Shakespeare plays), music concerts and very traditional barn dances – which sometimes happen in the village. Last but not least is our village Feast during the second week of August there are activities each day with the final show day on the Saturday. Some of our teenage students entered the competition and two of them won first prize for cookies!! We mustn’t forget about food. We have our own large vegetable garden and during the summer it is at its best – fresh cucumbers, tomatoes and lettuce as well as a chance to pick raspberries and strawberries, all straight from the garden. We love to cook and what can compare with food picked freshly from the garden and put straight into the pan – truly scrumptious! So, come in summer and create some wonderful memories. 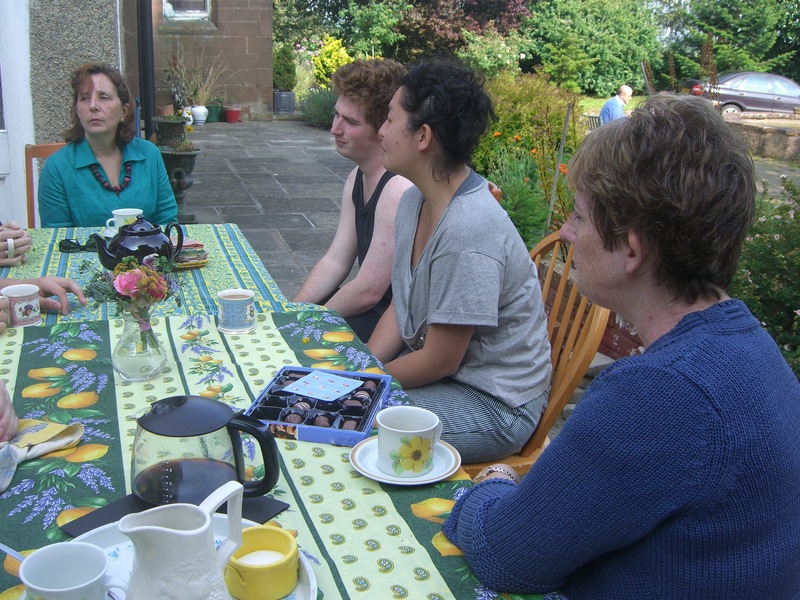 I’ll leave you with a snapshot of some of our students at Fleetham Lodge in Summer. Situated right between the Yorkshire Moors and the Yorkshire Dales gives us easy access to two important UK National Parks. 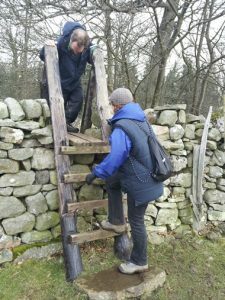 Not only do they both have wonderful scenery, but they also have hundreds of public footpaths giving access to several walks. 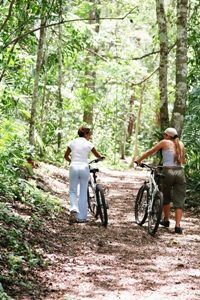 These walks range from a very gentle stroll to a tougher hill climb and can take from half an hour to almost a day to cover. You may remember that earlier in the year I did a series of walks to showcase some of the fantastic places that can be seen in both of our National Parks. If you have an interest in getting outdoors and walking then you should definitely consider our English and Walking course. We have chosen some wonderful walks of differing lengths to suit a short afternoon stroll and a whole day adventure all through wonderful countryside and all featuring some very traditional and cosy pubs where we can stop for lunch or a drink after the walk. 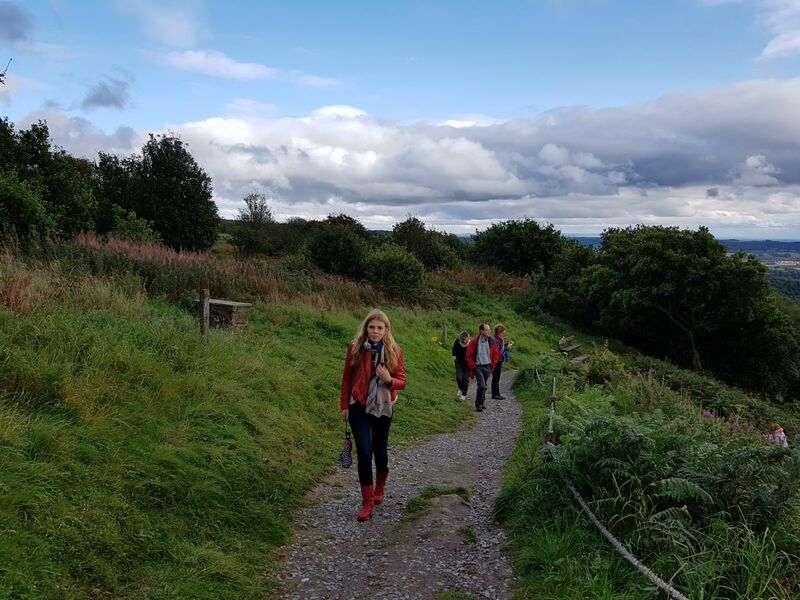 Walking is one of the very best ways of practising and improving English as there is plenty of time to chat while you are enjoying the scenery. In fact we usually include a small walk in all of our courses – the most usual being a local walk from Fleetham Lodge around the villages – a short loop taking about and hour and allowing you to get to know the local area just in case you want to go off yourself on a short walk or cycle ride. 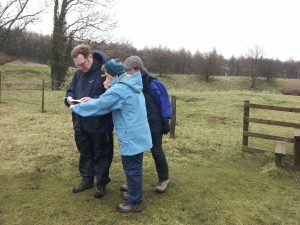 If you enjoy walking then this course will be a great treat! 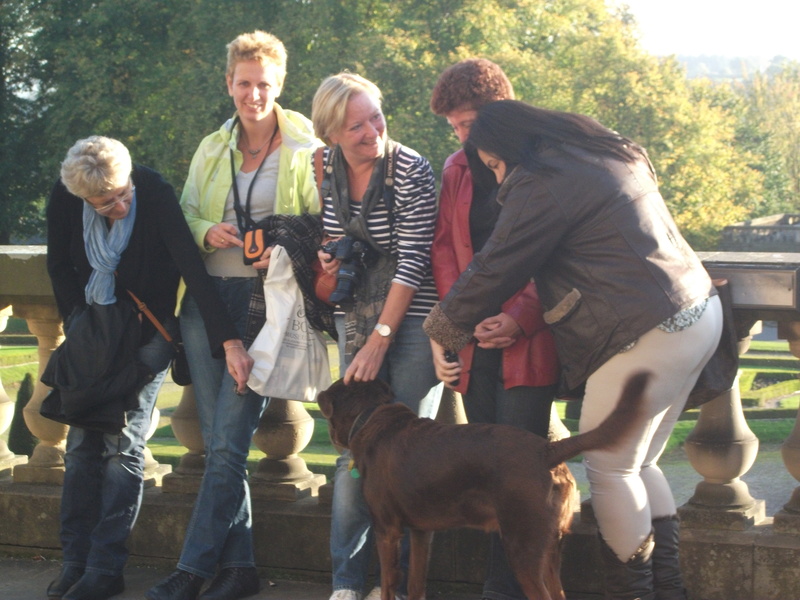 We’ll choose a different walk each afternoon and you’ll do some preparation for it in the morning English lesson – this will be about the area, terrain and any local information regarding history or interesting facts, things to look out for etc. We’ll choose different types of view and scenery from the coast to the hills. There will be a chance to take in some historical venues on some of the routes and at the weekend we’ll head off for a whole day on a long (but not necessarily strenuous) walk and, weather permitting, we’ll take a picnic or enjoy a pub lunch in a very traditional, quaint English pub. It’s funny how many walks seem to begin at, end at or have a half-way point at a pub! 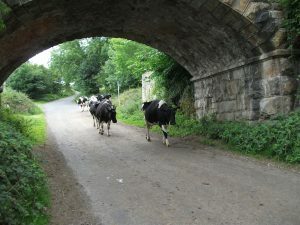 Some exciting features we have encountered with students were a herd of cows while passing under a railway tunnel, large stepping stones across a river and some amazing waterfalls. Being out in the open always brings up some surprising encounters which, in turn, allows for some new language to come through. This all helps with learning and increases the enjoyment of both the learning process and the immediate surroundings. What better combination – the outdoors (with some of the unexpected), good company, beautiful scenery and the promise of good food and drink along the way. This could be a little bit of heaven!! 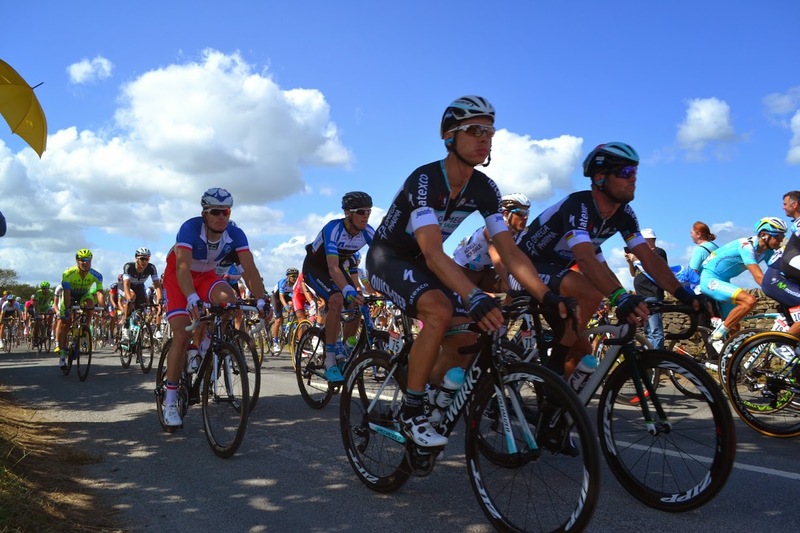 If you are a keen cyclist then you will certainly know what an amazing event the 2014 Grand Depart for the Tour de France was here in Yorkshire! 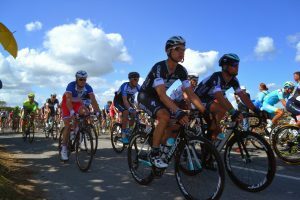 It was one of the greatest spectacles that this county has ever seen and 2 million people turned out to watch (and many were on their bicycles following the riders too). I went with husband and daughter to Leyburn to experience this first hand. It was an incredible sight to see them emerge over the hill and rush down to where we were all congregated. 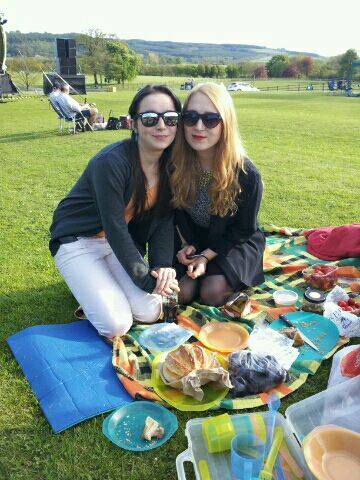 The whole day had a party-atmosphere. were coloured in the cycling jersey colours. And the weather on that day in Leyburn was wonderful making the whole day one to remember. You may also know that following this event there has been a Tour de Yorkshire every year since. And that’s not all in the cycling world – in 2019 Yorkshire will again be the centre of cycling when it hosts the Road World Championships. So why are these great cycling events coming to Yorkshire? Here at Fleetham Lodge you can get straight on to your bike from the front door – no need to travel anywhere. 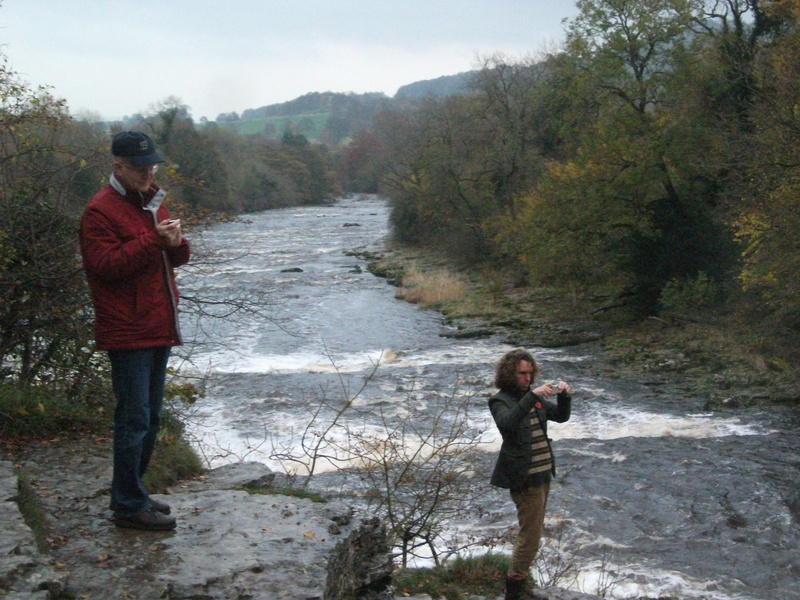 To get into the Dales (where some of the most famous scenes from 2014 are shown) it is a short drive (and we take you) or you can travel on the local railway with your bike – which is a whole other experience and one which we always offer. 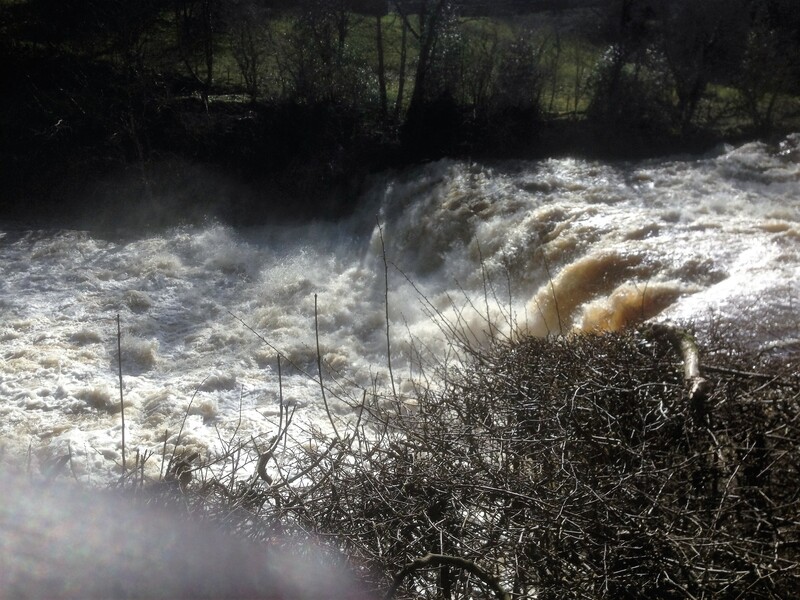 We have sourced excellent routes in both the Dales and the Moors which, if you are a keen cyclist, we know will excite you. 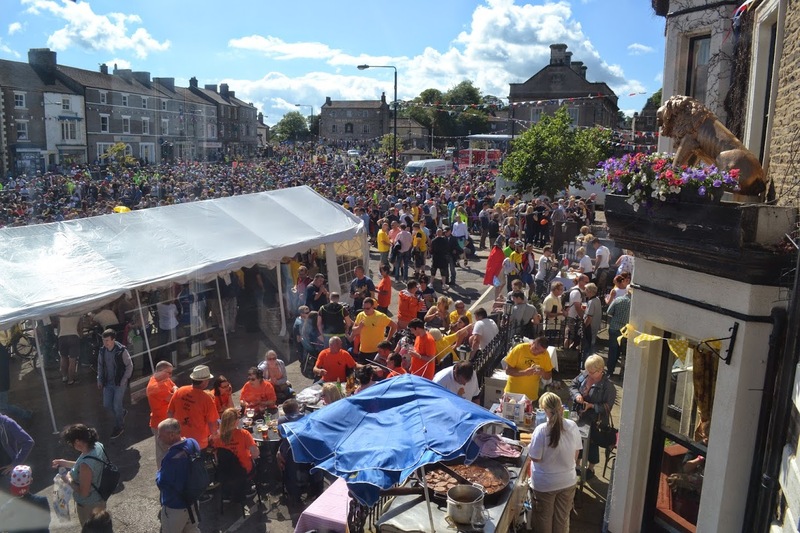 The scenery, the fabulous dales and moors villages, the array of pubs and beers and the camaraderie are all the things that make this a great experience. Classes are held in the mornings generally but if the weather forecast looks worrying for the afternoon we will swap things around. 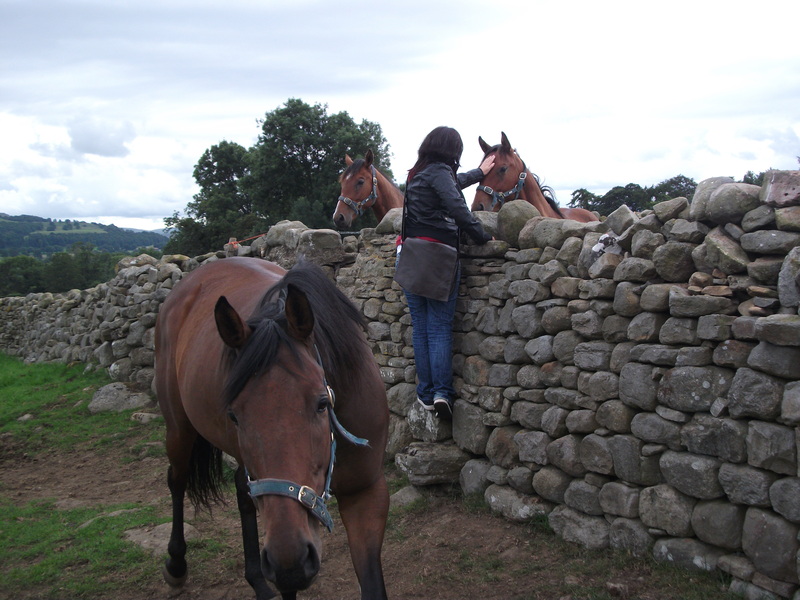 An all-day ride at the weekend gives you a chance to see more and relax over lunch before the return route. Most students can’t wait to get out on the bikes to a new area and that is great but we also add some non cycling visits as well to give everyone a rest and see other things in the area. English and Cycling is a great course for a family group too. The children love the freedom of being able to cycle on the quiet roads (we have bikes and helmets) around the village (supervised, naturally) and those who are used to cycling can take off with their parents and our guides on longer rides. 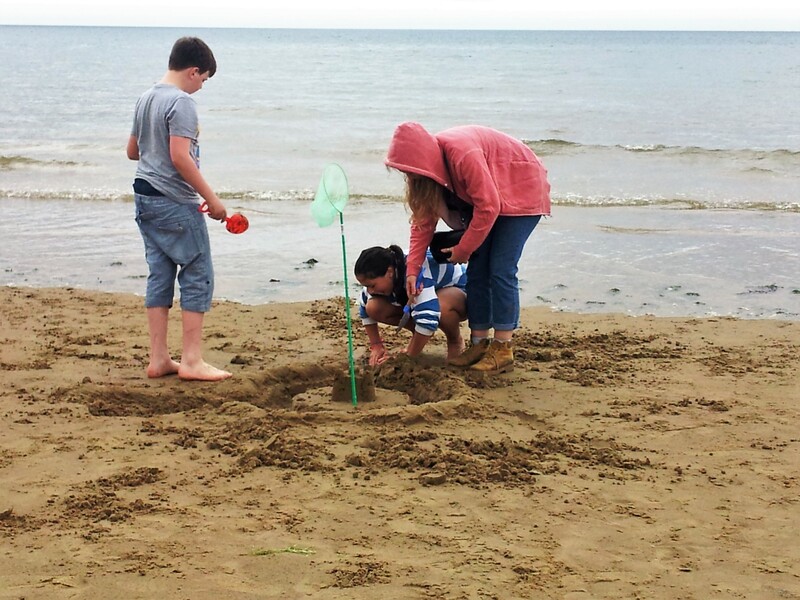 It’s a fun, healthy and unique way to have a family holiday and improve English skills too. 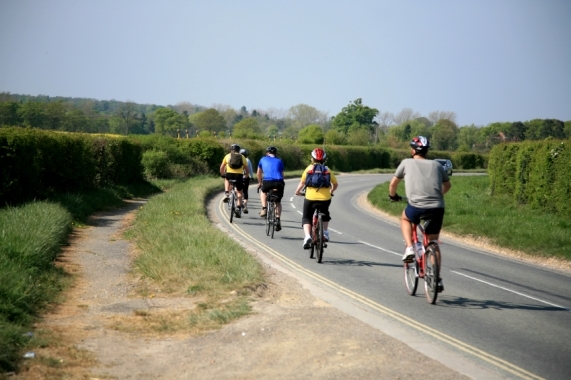 Cycling is a good, all-year activity so you can book a course at any time. If you are not one of the hardy types then May and September are perfect. Here at Fleetham Lodge we have three speciality courses – English and Golf, English and Cycling and English and Walking. Over the next three weeks I want to showcase each of these and talk about those intrepid students who have come here to Fleetham Lodge to engage in these activities. This week I want to write about our most sought-after one which is English and Golf. Golf is a very popular game here in the UK and we have golf courses tucked around every corner – or so it might seem. 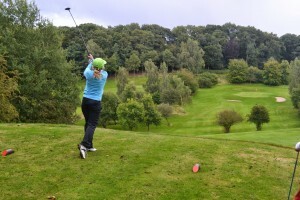 At Fleetham Lodge we are fortunate to have a dozen golf courses all within about a 30-minute drive which means that when you come on our English and Golf programme you can play on a different golf course just about every day! 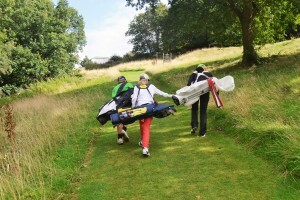 Another advantage of this English and Golf course (for adults as well as juniors) is that we match you, on some days, with local golfers which means that all the time you are playing golf you are using your English in an authentic situation and making new friends with whom you can go and have a drink afterwards. Karina from Germany came for 2 weeks with her children to improve English and also play golf. The idea was to study every morning and play golf every afternoon. On the first day we hooked Karina up with two local lady golfers who played with Karina and then took her for lunch at the golf club (we hadn’t expected this and it was such a lovely gesture). The two children meanwhile joined a local golf roll-up (i.e. 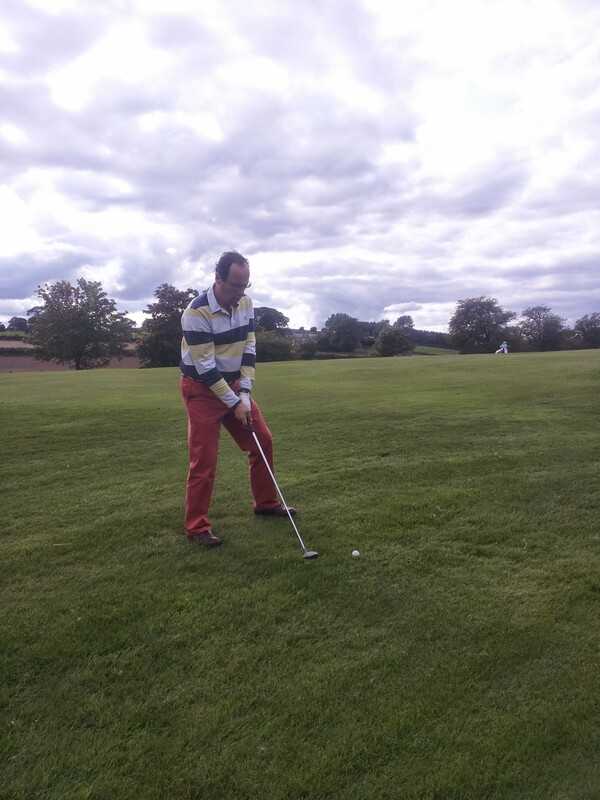 turn up and play/train) with the pro at Richmond golf club. During this session they both made new friends and we were able to arrange extra golf matches during the week for them. The roll-ups are a great way for juniors to get training and make new friends. During the two weeks the family were with us, they played 8 different golf courses and visited their favourites, Richmond and Romanby, for a second time. 4 keen golfers came from Germany for a week with the proviso that they wanted ‘a little’ English tuition and ‘a lot of’ golf. 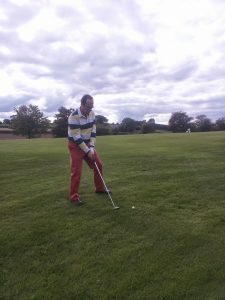 So, we put golf first and organised games each day with a whole day on Saturday, some with the group and others in two groups with local golfers. They visited 6 courses and enjoyed each one. The favourite seemed to be Richmond as well for its interesting terrain. As the courses are quite close then most of the time was on the course and there was plenty of time to go in the clubhouse for a drink after. And the English? Well, as this was secondary, we fit it all in here and there around the golf and it worked a treat! Participating in our English and Golf is very easy, all you need are your clubs – we organise the venues, book the games, pay the green fees, get you a trolley and take and deliver you to and from every course. We know a lot of local golfers and will fix up games, once we know your handicap, on some days with suitable golf buddies. 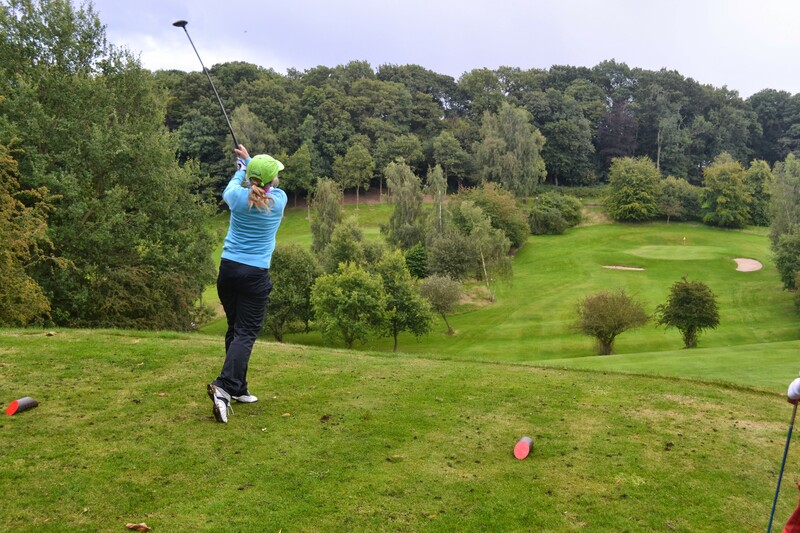 As the home of golf (we are not too far from Scotland) there is much on offer in terms of great local courses and with everything taken care of – you just need to bring your best game and enjoy playing. Oh, and your new golf buddies? 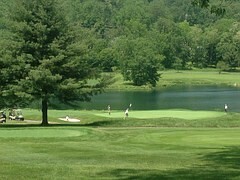 We’ll invite them here for dinner too so you can continue your golfing anecdotes over a well-deserved meal. For the fourth and final Case Study I want to share one of our family courses. 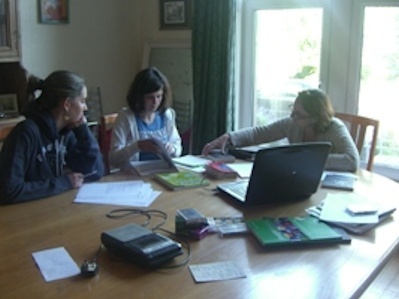 Family courses are a relatively new thing for us here at Fleetham Lodge with the first one taking place in 2013. 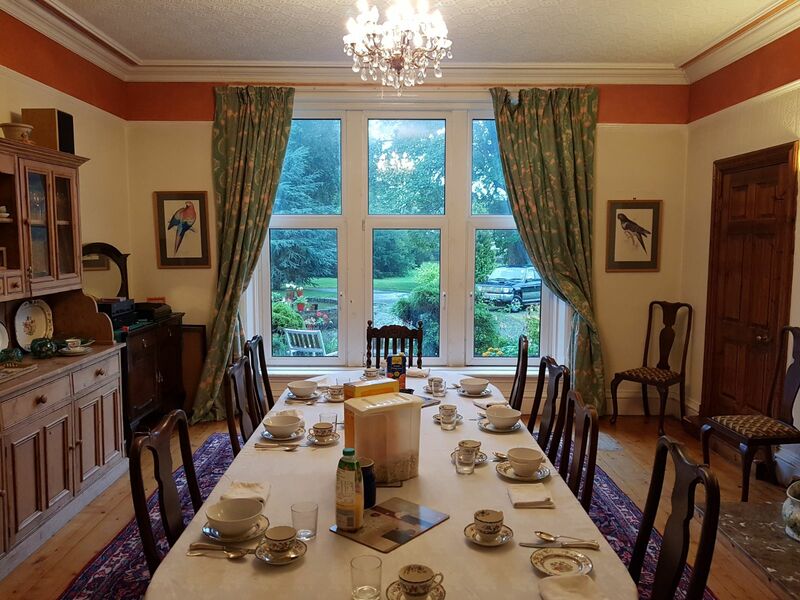 Fleetham Lodge is a perfect venue for a family group as all the student bedrooms are located on one floor and so the family can have this whole floor to themselves giving them complete privacy. There are 4 rooms, three have double/king-size beds and one has twin beds which means that a combination of different family groups – a couple and their children or two families (we have had two mothers who were friends with their respective children) etc. can easily be accommodated with up to 5 or 6 people. There is also access to the laundry room for those more mundane tasks, if required. The family I want to feature in this post came from Japan and consisted of mother and two children aged 13 and 9. The 13 year old was already studying at an international boarding school and his sister was going to follow him there in time. The children had been to a summer camp in the US and wanted a more focused course to improve their English skills before returning to school. All three wanted to have lessons but they all had different needs. Wakaba the 9 year old had some English and was rather shy and didn’t like to speak much, Ghota her brother spoke well and quite fluently but wanted help with grammar and writing for school and their mother wanted to brush up on her skills and improve her fluency. We organised for two teachers with experience of teaching children to share the classes. Ghota had 3 hours each morning, the mother two hours and Wakaba an hour and a half after which she would play with one of my two daughters who were here at the time. This worked out very well for all concerned. In the afternoons we went out on visits. The family, especially the mother, were interested in history and culture so we visited castles, gardens and had a tour of a country mansion. They also wanted to swim and enjoyed playing with our dogs in the garden as well as games such as croquet and tennis. When the family arrived they were very pleasantly surprised to see lots of green fields, sheep and small, pretty villages. They had understood that the north of England was all industrialised! A good lesson for us to learn for our marketing as actually North Yorkshire is not only the largest county in the whole country, but also one without any cities (York is not part of the county) making it one of the most rural areas in the UK. The freedom for the children to run around in the garden freely and safely, being able to travel around to various places without experiencing any traffic jams or delays (our commute to our daughter’s school 35 miles away takes 90 minutes there and back home – this would be impossible in many southern parts of the country) means more time spent at the venue and also a chance to run off steam. 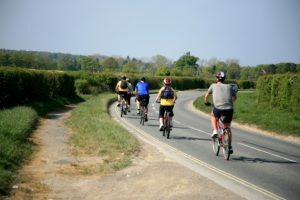 Our local lanes are great for a bike ride (and walking too) they are quite flat, very quiet and safe and we have cycles and helmets for everyone. Ghota and Wakaba also enjoyed a cooking session with one of the teachers and lots of games and craft sessions. 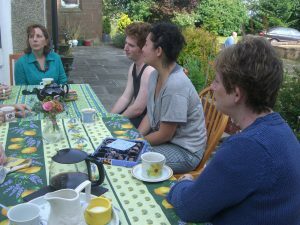 For Mum the most enjoyable thing was to sit in the evenings with us while the children engaged in movies, games or craft before bed and just have some adult time over a glass of wine or a cup of tea. 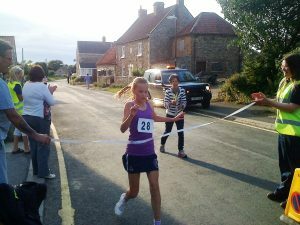 This was great for her English but also a chance to unwind and enjoy the peace and quiet of this beautiful rural setting. 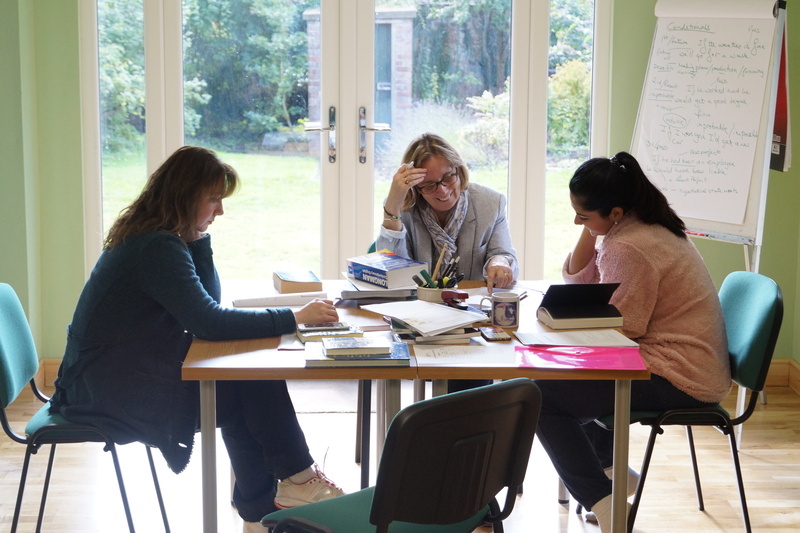 If you would like to study English as a family then this is a really perfect venue, lots of space, dedicated teachers for the adults and children, great new venues to visit and explore away from the busy city. 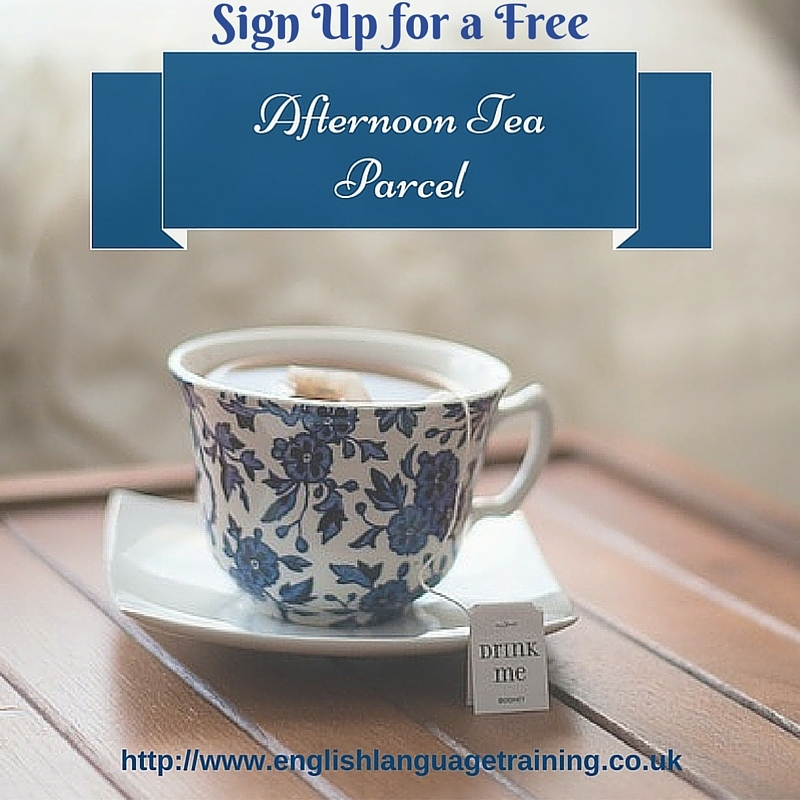 Fresh air, good, fresh,local food, people to socialise with, the space to relax and unwind as you learn. And not forgetting, a chance to have fun as a family without worrying about food, shopping or what to do tomorrow!!! 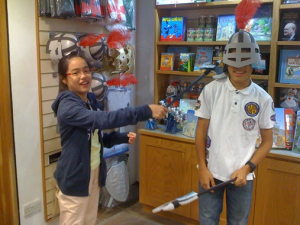 This week I want to look at two students who came on a Teenage Immersion courses. Although these are aimed at groups of 4 students we do also run them for just one or two. 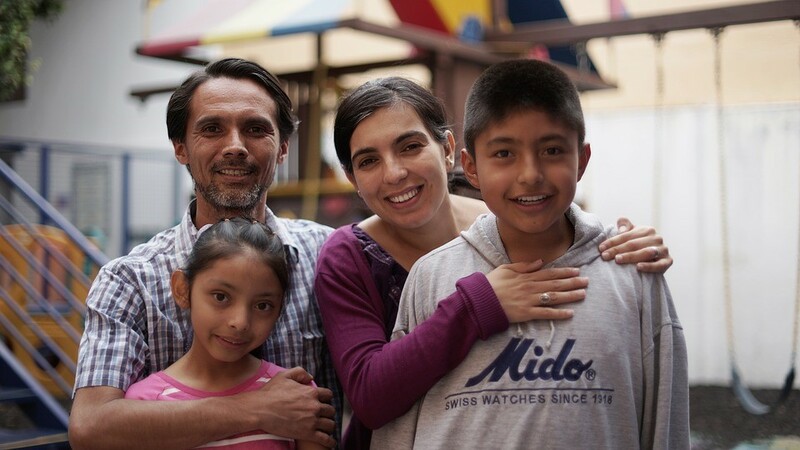 This week I want to introduce two teenage students to you – Marie who was 16 when she came for her course and Yohann who was 19. They both had similar desires for their future, namely getting into the schools of their choice for the next stage of their education. Both students happened to be from France. Marie wanted to continue her education for the final two years in the UK and had applied to a boarding school here. The school was happy to accept her but felt that her English was not quite up to the level for A levels and,as a result, she might struggle unless she worked on it first. They recommended that she took around a month of lessons, preferably intensively, over the summer. As we had had students before from this school they recommended us and I subsequently spoke to Marie’s parents. Marie was only available for three weeks so we agreed to do as much as possible in that time. Marie had not really enjoyed English at her school in France and was not too happy about spending 3 weeks studying it. However she really wanted to go to the school so she bit the bullet and actually worked really well in both lessons and homework. We had lessons together for around 5 hours each day spread across the morning and afternoon plus an hour’s homework most evenings. As well as grammar and vocabulary, we worked on fluency in speaking (this began to happen almost immediately) and, of course, a lot on writing as this would be key in her school work. Progress was fast and I kept in touch with both her parents and the school as the time for them to confirm her place for the next school year was quite tight. Towards the end of the course the school tested her again and the result was quite different from her previous one and her place was confirmed! Everyone was thrilled and she went on to have an amazing time at her chosen school. As is always the case on our course it wasn’t always study. 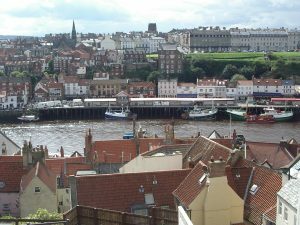 We also went out on visits to various local places and enjoyed some activities together, including a day in York (where she wanted to buy some ‘cool’ clothes for school) and a relaxing dinner at the local pub. Marie was a real success story for us as we helped her reach her dream and I know that she was successful after school in gaining a place at university in the UK. Yoann’s dream was to study Business at Boston University in the US. He needed quite a high TOEFL score to do this and so he wanted to try and achieve this in the fastest time possible so that he could leave for the States and get settled. 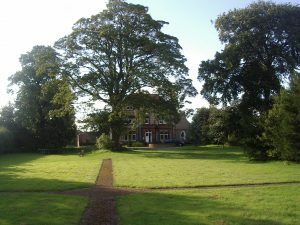 He arrived at Fleetham Lodge in September and he hoped to be in Boston in January. 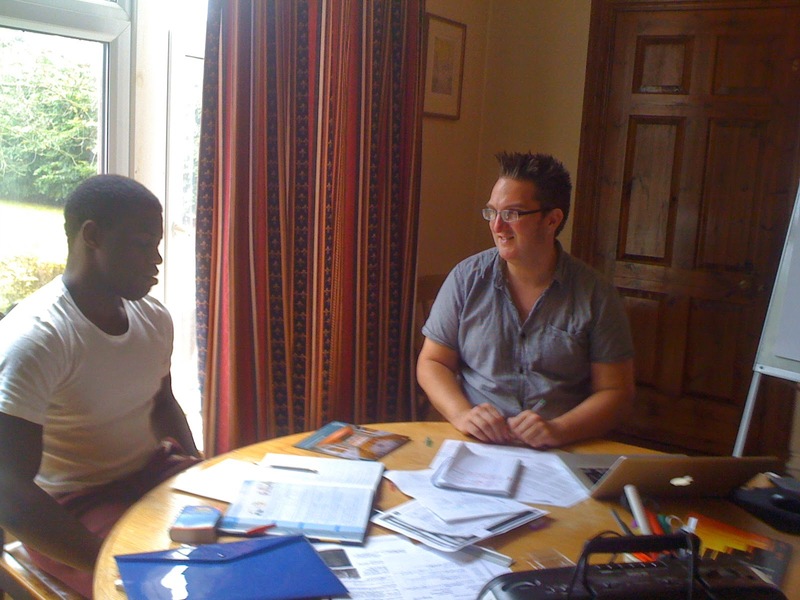 He would study here intensively on TOEFL for around 2 months. Like Marie English had not been a favourite subject and although he spoke very well his other skills need to catch up for him to get the score he needed to achieve a place on the Business Degree course. We set to work on writing, reading and listening as well as grammar and vocabulary. There was quite a bit to do to catch up to his great speaking skills. Using a range of different materials and techniques things started to improve and as we moved forward the TOEFL scores in practice started to approach what he needed. We learned after a couple of weeks that Yoann’s course did not actually begin until September in the following year and so he enrolled into a pre-sessional language course for 6 months and decided to take the exam in the US. 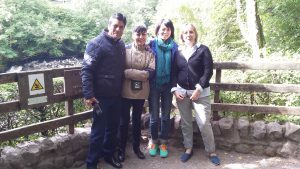 This meant that we could concentrate fully on improving his English overall in readiness for this course and life in the US. Yoann was with us for some weeks and he really wanted to go to the gym, play football (his passion) and get out and about locally. We managed to find him a local five-aside football team with whom he could train weekly and helped him enrol in a local gym. 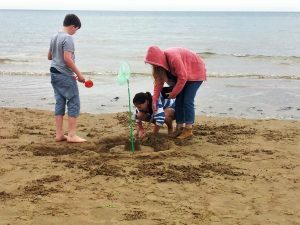 These activities helped with his language and when he said he was leaving his new-found friends were genuinely sad to lose him. For those few weeks Yoann really became a part of our local community. 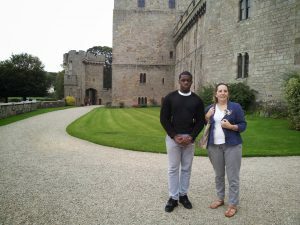 There were activities and outings too including a premiership football match at Newcastle United that we organised and a visit to a real-life castle which is still inhabited something Yoann had really wanted to see. This was another success story and not untypical of the things we are able to provide for our students in order that they not only enjoy their study with us but also exceed their expectations in terms of progress. Here we are with the second of my 4 case studies and for this post I want to introduce two IELTS students to you, both doctors; Lera from Russia and Sophia from Germany. The IELTS Workshops are aimed at students who need band 7 at least (many of the students who have come need higher scores than this – band 7 in all or even band 7.5 or 8). 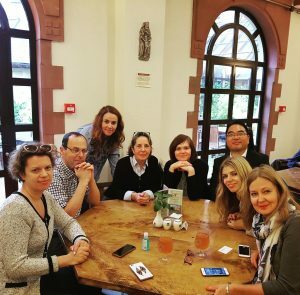 During the course (this is usually 3 or 4 days or a full week ) we work on IELTS for around 6 hours each day (this may sound tough but actually it’s all well-paced and we take breaks so it generally works out well) and it truly is an IELTS immersion. Of course we have some time to relax in the evenings and at the weekend. For Lera to register as a doctor in the UK the IELTS requirement was band 7.5 overall and a minimum of band 7 in each of the 4 parts of the exam. For Sophia who was applying in New Zealand the requirement is 7 in reading and writing and 7.5 in speaking and listening. These are very tough scores to achieve (given that 9 is ‘native speaker’ level). Lera had taken the exam twice and was currently around 6.5 and Sophia had taken it 12 times (spread over several years) and her scores had been fluctuating. Coming here for an IELTS (Immersion) Workshop means being surrounded by English all day so this helps to put students into an ‘English’ frame of mind and helps them to be really concentrated on the work in hand. 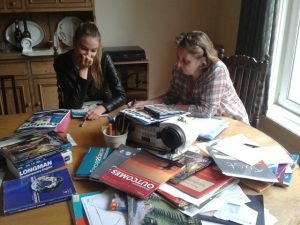 Sophia was a little disillusioned by her IELTS history and had achieved some really amazing scores (a 9 in reading at one exam) but the scores were not coming together in one sitting. We needed to work mostly on speaking and listening as these required higher levels and also make sure the writing achieved and maintained at least band 7. One of the biggest tasks was to help her to remain calm in the speaking exam as nerves made her ‘run-away’ with the speaking. 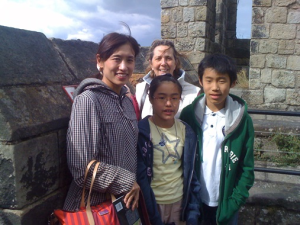 Confidence – unsurprisingly after many attempts at the exam was also something to engender – however she was always cheerful and determined to succeed in her desire to work in New Zealand and to make a new life with her family. By working systematically and intensively on specific areas or speaking, listening and writing, the scores began to increase and stabilise. This can happen very quickly when students grasp some of the techniques and then the next job was to make sure that these continued to build up to the day of the exam. To do this we continued to meet online after Sophia had returned home. The exam went well and Sophia felt she had performed well in each part but now we needed to wait for the results. She could follow her dream to go to New Zealand. I know that her whole family is now enjoying their new life there. Lera was looking to go and do further medical training at university. She is a qualified doctor but needed to do further training in order to work in the UK in the medical field. She had been studying IELTS for sometime and taken one exam which had not delivered her band. Her dream was to work in medicine in the UK. She was, when I met her, working as an art tutor and is a very talented artist. We first worked online on my IELTS Intensive 3-month course before Lera decided that she wanted to come here to Yorkshire and take the IELTS workshop. She came for two days and then came again for a further 4 days just before her exam. For Lera the two areas which were challenging were Listening and Writing. Writing was good but the timing proved to be the main issue (this is true for many students). It was only when we worked face to face that I discovered what the main problem was with listening – Lera was underlining too many key words and so when she began to listen she was trying to focus on all of these words and ended up not really following what was being said – she couldn’t “(see) ‘hear’ the wood for the trees!” Once we were able to cut this down to just one main key word for each question then the scores improved dramatically and in her exam Lera achieved an amazing band 7.5 in listening. It was late November when Lera came for the second time and there were two IELTS students on this workshop and thinking about her exam always conjures up the smell of wood smoke as we had a wood-burning stove in the room to keep us all cosy as we studied. Lera was successful in the exam which she took just a couple of days after returning home and as well as her fantastic listening result she also achieved band 8 in speaking. She stayed up all night to get the result and was so excited when it came. You can see my interview with her on YouTube here. I can now tell you that Lera is now working in research here in the UK and is about to do even more study at university. 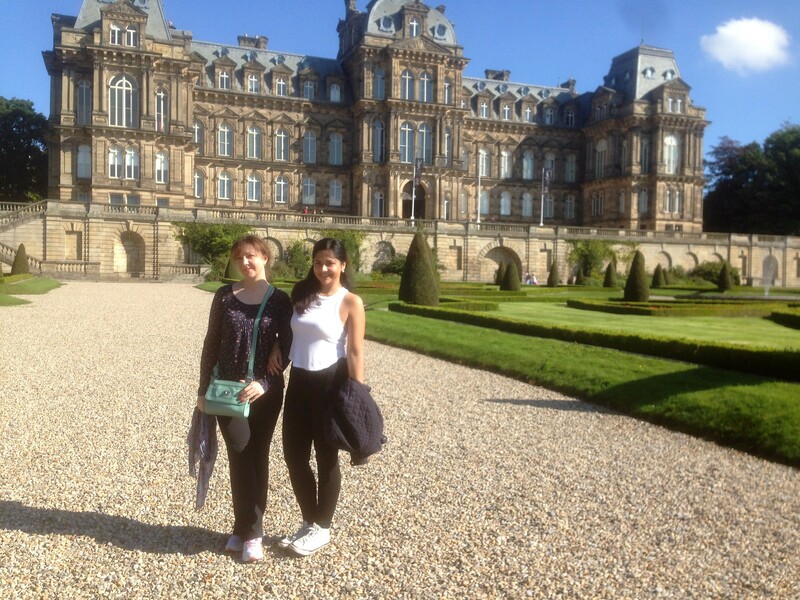 Both Sophia were hard working and determined in their ambition to be successful and IELTS was an important key to their success. I am very proud to have played a part in their success and it was just as exciting for me to hear about their results. I hear from them both from time to time and I know that they are both enjoying the dream that they planned for a long time and that coming here to take an IELTS Workshop made a big difference to them in their IELTS success. 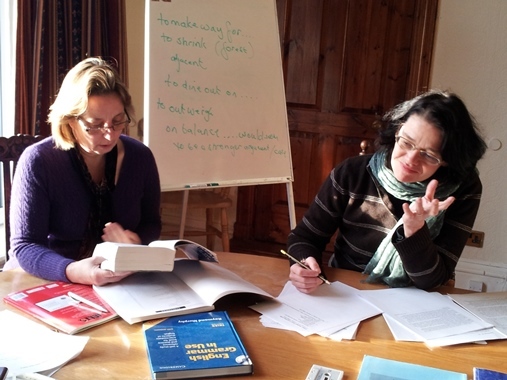 To give you a flavour about actual immersion courses here at Fleetham Lodge I thought I’d run a short series of case studies in my next few posts. 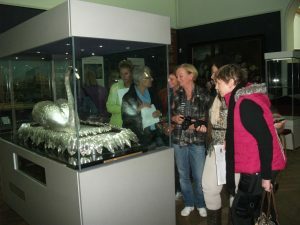 It will give an insight into why these students chose to come here, their experience here and also what they achieved. Perhaps your situation is similar to some of these students and then you can see exactly how an immersion course here will give you the result you are looking for. Four students from the Netherlands. This was my very first full group of 4. The four women worked for a university in the Netherlands and as a result of changes within the organisation they found themselves having to use English more and more both with the international students, in their teaching, and for the administrators, with overseas agencies and businesses to arrange placements. The university had a good programme of English training for all the staff and arranged for them to travel to the UK for 5 days to undertake intensive training. Our 4 students arrived on a dark October Sunday evening in Leeds where we met them and transported them to Fleetham Lodge. There was, I learned later, some resistance to this training as the women had been at the university for some time and were not all happy about the changes. In fact one of them had stated (in Dutch, so I hadn’t understood this) that she was not going to speak at all during the course. I want to relate this because what happened during the week to this student was quite remarkable. We arrived, had a cup of tea and everyone went off to bed. The student who had announced her refusal to speak was unfortunately forced to return to the kitchen to request something and this not only broke her silence but also brought home the fact that here there is NO CHOICE but to speak English! The lessons began the next day and once we got started we had a tremendously fun week. All the group members had quite good English but for some of them it had been many years since they had used it much – hence the fear. The topics covered in the lessons were email writing as they all needed to send emails regularly to various overseas business and other universities. We covered register (the right language for the right situation), language fluency, as now all of them were using English regularly with students around the university, and finally some presentation skills for teaching in English and also presenting their students to potential businesses for securing placements. Confidence improved day by day and very little Dutch was spoken at all even within the group. 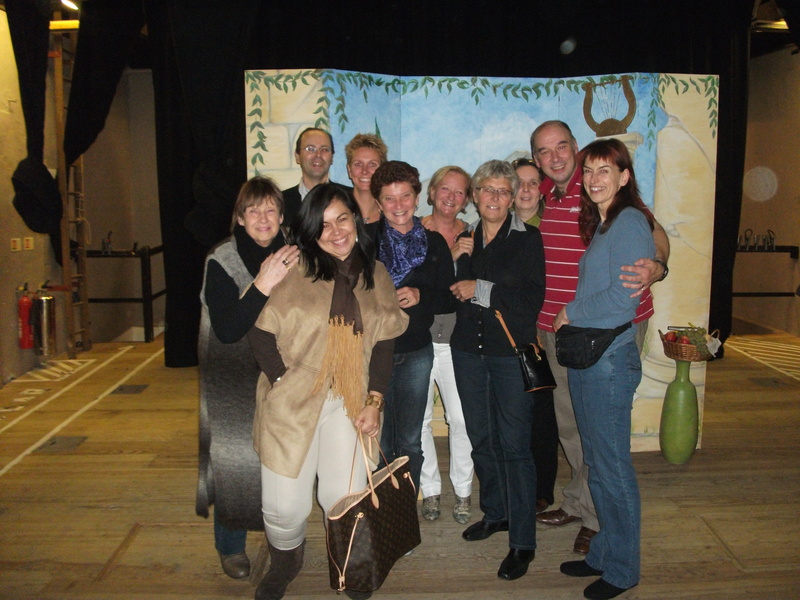 One of the memorable activities was a visit to the theatre. 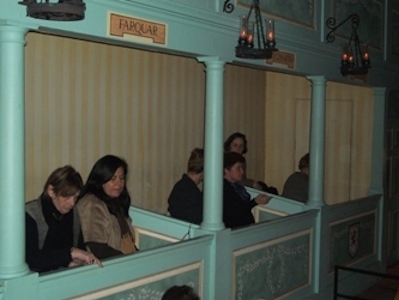 The Georgian theatre in Richmond is very small and intimate and as a result (the show was a comedy) the performers kept including the audience and of course our group got dragged into the performance with one actually going up on stage. After the show we were invited to the bar to meet the actors and they were fascinated that people had come all the way from Holland to see them. We asked to take a photo with them and they decided that this would be best done on the stage – we were all so chuffed at this as it is unusual but it made for a wonderful end to the course. 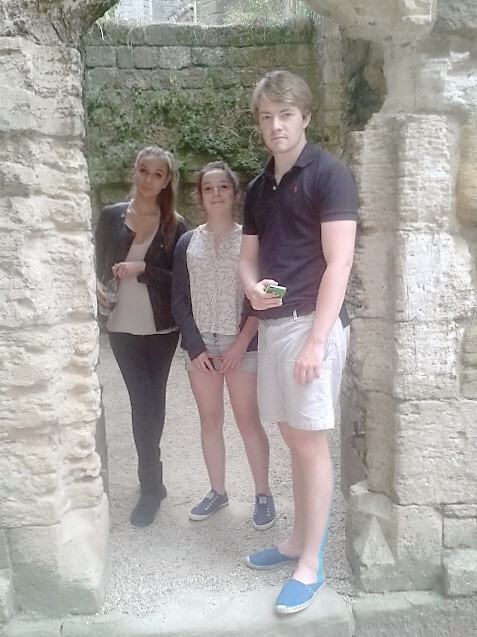 Also, I have to share with you – on a tour of the theatre before the performance – the student who said that she would not say anything in English on the Sunday evening when the group arrived – asked question after question to the tour guide – the rest of us just stood in awe!! What a fantastic result!! 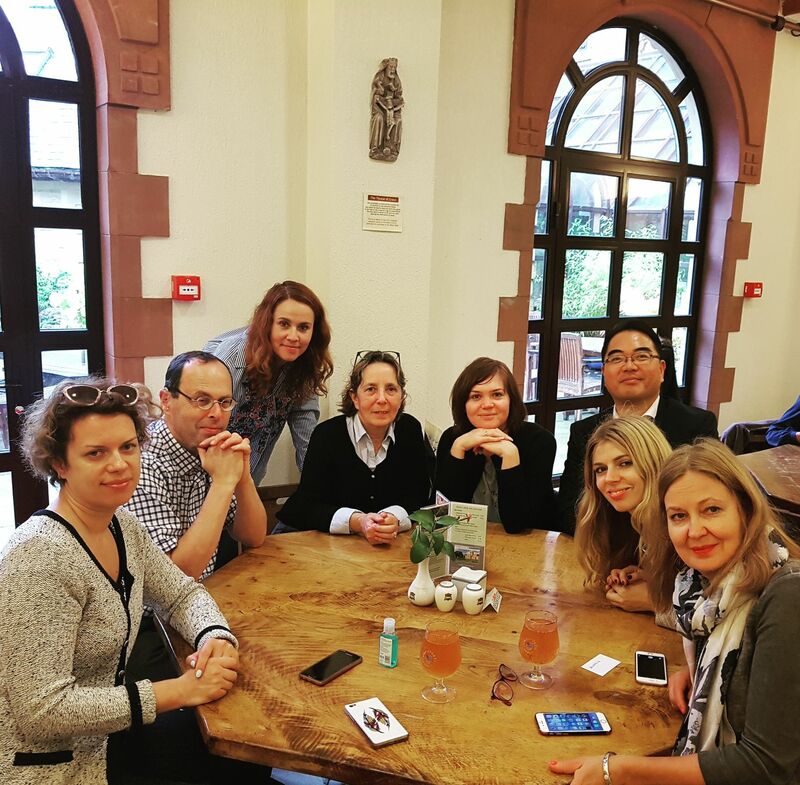 I had a wonderful time and feel a little bit jealous of the colleagues that are allowed to visit you next time! I’ve learned a lot and really enjoyed your lessons, it was fun. I can imagine how quiet it will be there! I think I’ve never learned so much before in one week. It surely was a great week! I had a wonderful week at your place, enjoyed it from the first till the last minute, especially the last evening! So thank you very much for making us so comfortable, and not giving me the idea my English was too bad! Indeed, I was very exhausted when I came home, but had the whole weekend to recover.